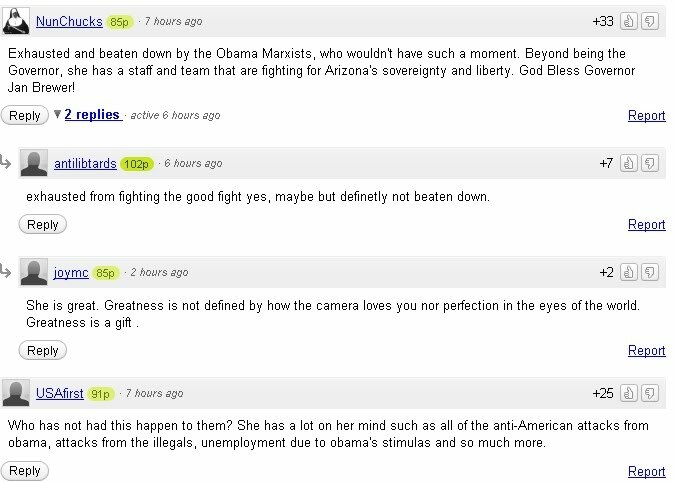 I commented earlier on Arizona's idiot-in-chief's failure at the gubernatorial debate in which she had stumbled in her intro, failing to say anything really, and then fled the debate in a real hurry in order to avoid answering to reporters, but I was wondering what exactly the reaction was to Jan Brewer's performance was. We already know that a majority of Americans feel Brewer was a complete and utter failure, but let's take a look at her core audience - the folks who populate websites like Breitbart.tv. I love looking at the comments left behind on such right-wing sites like Breitbart's sites because they are always a dearth of reality and consist of numerous delusional comments. Every politician's worst nightmare comes true for AZ Governor Jan Brewer. Don't the right-wing critics claim Obama is focusing on too many things at one time and that the "lot on [his] plate" argument is null and void? Also, what difference does it make if Arizona's governor is better liked across the country? Some more of "lot on her plate" arguments, but more interesting is that the criticisms against her just happen to be "anti-American," yet if you look at NunChucks' comment, she is fighting for "Arizona's sovreignty and liberty" - didn't the south try that back in the 1860s? 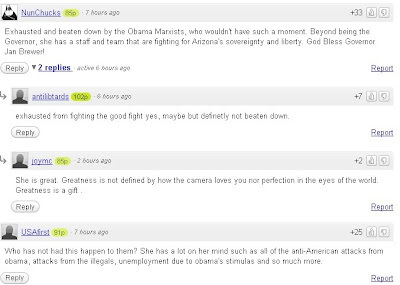 These comments were made in response to a "troll" who called Brewer's stammer a "Sarah Palin moment." I found them particularly interesting because they revive the 57-state Islam myth. I also thought the mention of the "Austrian" comment was funny, because there are some distinctions between the German spoke in Germany and the German spoke in Austria - just consider the differences in the Spanish language, where each country may have significantly different vocabularies (when I had visited Spain I had trouble understanding Andalusians because of the differences from Castillian Spanish). Granted, they are silly mistakes, but nothing like completely flubbing a debate. Also, notice the flaming? Let's just say that comment was reported, although we doubt it will be removed (maybe its time we do another story surrounding around the flaming prevalent among right-wingers). I thought this comment was interesting because they attack Obama for having teleprompters and praise Brewer for "ditch[ing] the script." First off, when did Obama have a teleprompter in the debates, and secondly, using the "teleprompter" argument just doesn't fly - she had her papers right there! At any moment, she could have looked down at her notes and talked about the wonderful things she did as governor - considering her defense of the immigration bill, she could have yelled out "SB1070" and started pumping her arms in the air like Arsenio Hall and her fans at home would have turned off the television happy. Eileen first claims conservative candidates like Brewer are not seasoned politicians. She must not be familiar with the fact that Brewer is a seasoned politician - she was previously Arizona's secretary of state for 6 years, chairman of the Maricopa board of county commissioners for 7 years, a state senator for 9 years, and a state representative for 4 years, totaling up a total of 27 years of political experience (that includes her time as governor). 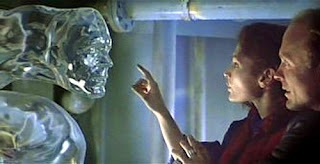 She then asks who would benefit from the negative portrayal of conservatives in the media. Considering the conservatives are looking to extend the Bush tax cuts for the wealthy, I would have to say that the average Arizonan would benefit. 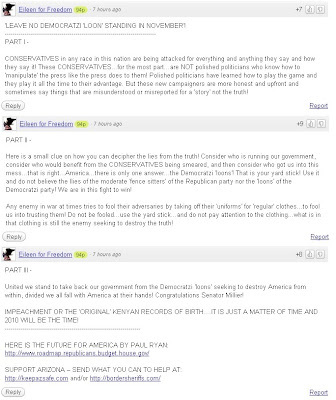 Thirdly, Eileen sees 2010 as the year Obama gets impeached or has his Kenyan birth certificate revealed. Need I say more? I think after all those comments (and that was only the first page) you can get the picture - people who support Jan Brewer are ignorant of pretty much everything. They are full of contradictions and have no shame in spouting their hypocrisy and propaganda. Sadly, I doubt Brewer's performance will hurt her much on the campaign trail unless her opponents hammer her for her incompetence. Kevin, you had to know what the resonse would be. Had brewer hiked hp her dress and taken a dump on the American Flag, the Republican yakosphere would have applauded.